Denmark striker Nicklas Bendtner has been suspended for six months by his country's football federation after he was arrested for drink driving. The 25-year-old has been on loan at Juventus from Arsenal this season but has been out injured since December. He was caught driving the wrong way down a street in Copenhagen and said on Twitter on Sunday: "I am very very sorry to all my friends and fans. "It is not ok to drink and drive. I take full responsibility." Bendtner was fined 842,000 Danish Crowns (£97,200) and had his driving licence suspended for three years. The Danish Football Federation (DBU) said that, as a result of being charged with a violation of the Road Traffic Act, he will not be considered for international duty. 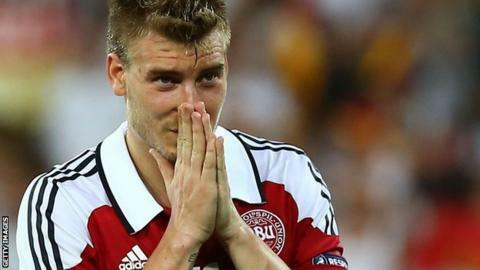 Bendtner is set to miss a number of World Cup 2014 qualifiers, including games against Czech Republic and Bulgaria later this month. "The DBU have demanded that Nicklas Bendtner take six months off to think over his international future," read a statement from Denmark's Football Federation. "The DBU respect the rights of all players to have a private life, but we also have certain rules that need to be met by international players in their public behaviour."